We knew were off to a good start when we earned the confidence of our first customers - AT&T, Ericsson, Abbott Laboratories, the European Space Agency and Texas Instruments. We've been on a roll ever since. Now our product line includes indispensable add-ons for Microsoft Office users as well as high-powered enterprise developer tools and specialized programs for engineers and scientists. Visual Integrity is still actively managed by its two co-founders, Jan Homan and Jean Haney. Both have 25 years of experience in the software industry. With pioneering vision and strong product instincts, together the founders have ensured that Visual Integrity's products have been in step with major market developments, trends and paradigm shifts while striving to make practical products with exceptional value for end-users and developers alike. With 17 successful years behind us, as we head into a new decade, we rededicate ourselves to you. We hope to continue to be a pleasant surprise in the software world - the company who reacts to your requests with unexpected responsiveness or with useful information to help you make a decision. We appreciate your trust and will continue to earn it. pdf2AutoCAD App - not for LT! The pdf2AutoCAD plug-in opens one page PDF files. For multipage conversions, support for layers, custom rotation and other advanced options, consider purchasing pdf2cad. The difference between pdf2cad and pdf2AutoCAD App – pdf2cad is an advanced standalone PDF conversion program while the pdf2AutoCAD App is a plug-in that requires an Autodesk program to run. 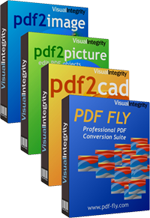 pdf2cad is a powerful standalone program available for both Microsoft Windows and Mac OS X. It not only opens a n editable PDF file but provides many advanced features and user-definable conversion options. With pdf2cad, you can convert multipage PDF files, control layers based on color or other attributes, rotate your file during conversion and more. The pdf2AutoCAD App is a plug-in for Autodesk products. It is Autodesk Approved and available in their Autodesk Exchange. df2AutoCAD will open any vector PDF file created using save, export or print-to-file on a computer. All objects can be modified. Text will be editable as MTEXT as long as it was stored as characters in the original PDF file. If it was “plotted” as pen strokes, the text will appear but can not be edited. The pdf2AutoCAD plug-in is not for scanned drawings and other raster PDF file. Converts PDF files into high-quality JPEG, GIF, PNG, TIFF and BMP images for publishing on websites or for use in most Microsoft® Windows® applications including Microsoft Office, Publisher. PowerPoint, Google Apps, and more! Transforms PDF files into editable vector drawings or high-fidelity images that you can use in Microsoft Office, Visio®, PowerPoint and more! Accurately extracts CAD drawings from PDF files with ease. In seconds, you can be editing a PDF file received from a supplier in AutoCAD or your favorite engineering tool. Outputs DWG, DXF and HPGL. PDF FLY combines our most popular vector and bitmap modules in one easy to use product. Use it to convert PDF, PostScript and EPS files. Since 1995, professionals in engineering, technical writing and illustration have relied on PDF FLY. It saves time, improves quality and streamlines workflow – all in one powerful product. All formats support a variety of intelligent filter options ensuring a top-quality match with the original. Multiple files or complete directories can be converted in batch mode as easily as a single file. For customers large and small across all industries, PDF FLY saves time and quality while enabling new workflows. META FLY is the metafile converter for professionals. Windows Metafiles (WMF) and Enhanced Metafiles (EMF) are the native Windows vector formats. Unfortunately, they don’t travel well. If you want to use them on the Web, UNIX, Linux, the Mac or in specialized applications, you’ll need to convert them. META FLY is the bridge. Use it to convert WMF and EMF to all industry-standard formats. Convert just one file as easily as multiple files or complete directories. Server versions and developer SDK versions available.